Osteoarthritisis or OA is the most common type of arthritis in elderly people with 1 in 2 people over the age of 65 having one or more joints with the disease. 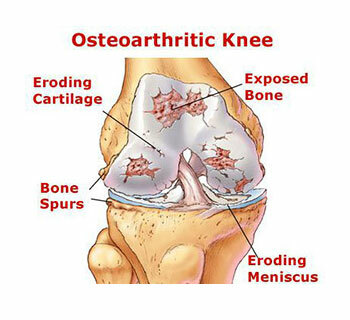 Osteoarthritis is a joint disease mainly affecting cartilage in in the joints. The function of bone is to provide support to the limbs and provide a surface shape for joints. e.g ball and socket joint. move or stabilize a joint and can attach over one joint or over two joints. attach bone to bone and are very strong, strong enough to shear a piece of bone off. absorb shock and lubricate joints via the synovial membrane which when stimulated produces lubrication in form of synovial fluid. Synovial membrane is normally a shiny surface but in cases of osteoarthritis the membrane becomes worn and uneven. Implications of osteoarthritis when shown on an x-ray reveal a narrowing between joint spaces where cartilage should be keeping joints apart. When cartilage wears down, the shape becomes uneven and less lubrication can happen as a result of weight bearing. Bony spurs may occur over time which are called “oseophytes”. These may break off in the joint to give more pain or locking. Rheumatoid arthritis can be contrasted due to its tendency to affect other parts of the body such as internal organs. RA begins at a younger age, causes swelling and redness and may make people sick or tired. It is the second most common type of arthritis. How does osteoarthritis affect people’s lives? Osteoarthritisis not only painful but also has financial implications, such as the cost of treatment and loss of income as well as other lifestyle implications such as higher risk of depression and anxiety as well as job limitations and reduced participation in everyday activities. Scientists don’t really know what triggers osteoarthritis. It can advance rapidly or slowly. 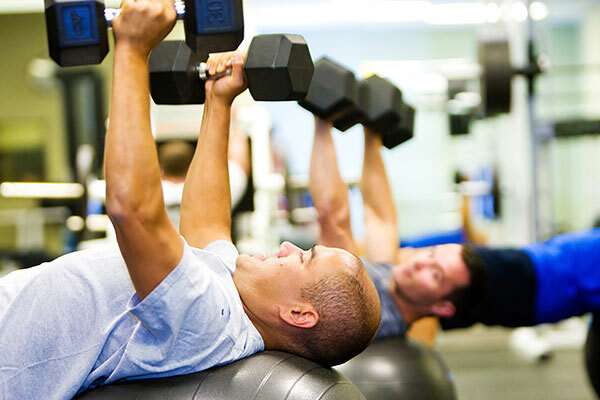 It is usually a slow progression, possibly starting with pain after working or exercise, then becoming more constant. What might contribute to osteoarthritis ? Ageing (uncontrollable), weight, joint injuries, stress due to repetitive job or high impact thru joints and genetic make-up all combine to contribute to osteoarthritis . Your joints health relies on the maintenance of good range of motion and strength around your joint. Without these things it is likely that you will have degeneration at a rate faster than necessary. Your physiotherapist can diagnose which muscles need strengthening and assist you with improving joint range of movement to ensure your risk factors for Osteoarthritisis reduced. Where on the body can you get Osteoarthritis or osteoarthritis ? Hands: Particularly common in women after menopause. Usually more common in women and the most hereditary location to have osteoarthritis . Small bony knobs on end of the fingers or soreness at base of the thumb. Can become stiff or aching or even numb. Knees: One of the bodies primary weight bearing joints – hence most commonly affected by osteoarthritis . The progression of knee wear and tear may be due to weakness in the pelvis or poor control of the weight through the feet. This presentation can progress to a very disabling pain making it hard to walk, stand from sitting or climb stairs. Hips: Can also be a severe disability. 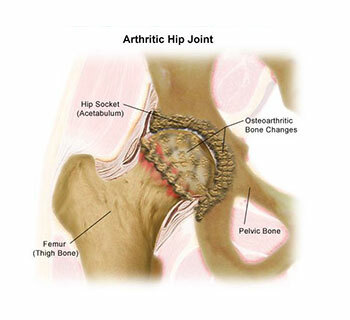 Osteoarthritisin the hips usually causes pain in the groin but can also be manifested in the hip, inner thighs, knees or buttocks. Spine: Can be in the lower back or in the neck. Symptoms may present as weakness, pain or numbness in the arms or legs. DUE TO NARROWING OF JOINT SPACES IN THE SPINE ..maybe osteophytes.. Often stresses on the spine are a result of poor posture and the degeneration of muscles and joints. The best way to treat Osteoarthritisis by getting your joints as healthy as they can be. This means stretching them and moving them to their best range of motion and strengthening the muscles around the joint to help protect it from every day forces of gravity and movement. 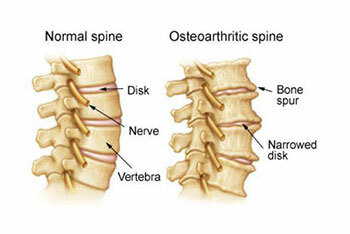 So many people claim that since they have Osteoarthritis nothing can be done. This couldn’t be further from the truth. A healthy diet, regularly exercise, fish oil supplements, braces and re-training of gait can all be additions to making your joints pain free. Unfortunately this isn’t a solution that ends there – osteoarthritis joints need to maintained like you maintain your garden. If you stop – it gets out of hand. Your physio should start you off in the right direction and then empower you with the knowledge and motivation to keep up the good work!.